Craig of apple-2.com has put together a great collection of Apple II software with a Floppy Emu theme. It’s a 32 MB bootable ProDOS disk image with an animated splash screen, and it uses the amazing Bitsy Bye program launcher to select from a variety of included games and utility programs. 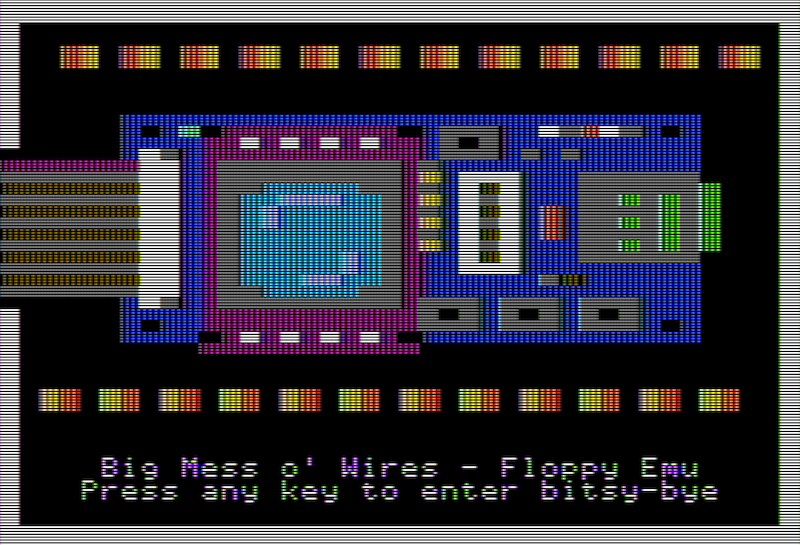 Floppy Emu can use this disk image to boot your computer, when the Emu is configured for Smartport hard disk emulation mode. Just rename the disk image to SMART0.PO and copy it to your SD card. It’s compatible with the Apple IIGS, Apple IIc and IIc+, and Apple IIe with Liron card. Craig cautions that some of the included games like CANNON.BLITZ may not work correctly when launched directly from Bitsy Bye, due to a memory conflict. If you find a game that crashes when run from Bitsy Bye, reboot and select GAMES.CATALOG from within Bitsy Bye. Then type in “-CANNON.BLITZ” or “BRUN CANNON.BLITZ” and the game should run normally. Don’t forget to check out apple-2.com’s other vintage download collections.